After being plagued by allergies for over a decade, Dr. Himsel had a tremendous breakthrough. He visited a chiropractor, and afterward, he was able to smell a rose for the first time. The experience stuck in his mind, and in college, he became fascinated by chiropractic’s holistic approach. To complete his chiropractic education, Dr. Himsel attended Logan University. While there, he discovered the connection between the chiropractic adjustment he’d received earlier in life and and how it aided in his body’s ability to function. I’d been seeing a chiropractor on and off for pain relief. In chiropractic college, I learned why chiropractic is a lifestyle and not just for when you have discomfort. 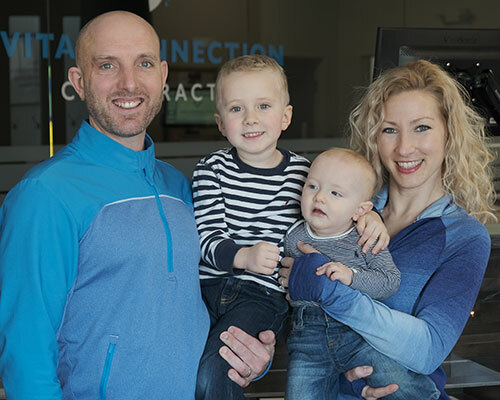 Directly after Dr. Himsel’s graduation, he opened Vital Connection Chiropractic in Fishers. Over the years, he’s developed a vitalistic approach that looks at the body as a whole, determining the source of stress to correct the problem. “Our unique focus achieves a high level of success across multiple conditions, not just for neck and back pain.” He is a board member of the Indiana State Chiropractic Association. Outside of the office, Dr. Himsel is focused on his family and living a healthy, moral and chiropractic-based lifestyle. His wife Heidi, his sons Andreas and Arlo he eat a diet of real, whole foods to naturally decrease inflammation in their body. Dr. Himsel likes to work out, spend time outside, hunt, and he loves sports – especially tennis, baseball, and golf. To give back to the community, he’s involved in different activities through his church and holds a Fresh Food drive for St. Vincent de Paul every Thanksgiving at the office. Contact us today to discuss what we may be able to do for you! Same-day appointments are available.